I’m a django developer. When I started working with angular I wanted to keep using DRY principles that I’m used to with Django Forms. For example defining validation, verbose_name, etc in your models. 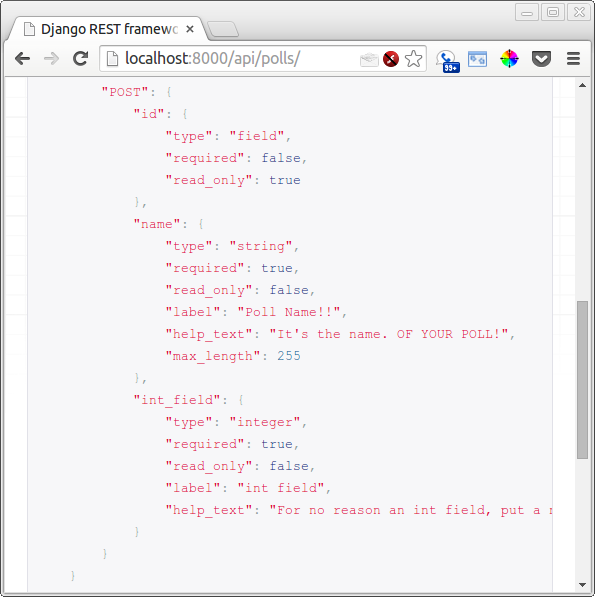 This guide should give you an overview of building a system with django-rest-framework (DRF) and angular. It should also give you some ideas on using the rest option method to pull in some data about your fields. Disclaimer – I’m a angular noob, criticism of this approach is much appreciated. The entire project is on github so please follow along. The guide assumes you understand angular basics. I won’t go into detail because their documentation is great. Run the project above and check out the options method if you haven’t already. We have some great info here like help_text, (some) validation, and verbose name is now called label. Let’s create a django admin like form that will save on blur. Most examples of angular forms I’ve seen are highly repetitive. This feels wrong when you’re used to the Django Forms framework. Luckily we can ask the options method for meta data about our forms. Here’s an interesting post about the “almost unused” options method. Our client side app still retains it’s decoupled nature from the server. The client doesn’t care whether DRF or typing monkeys are providing the options method. It just cares about what label to be using or whether the field is required. In this example we see a help_text span shows only when help text is available. Now our fields are becoming more generic looking. Generic and repetitive tasks can be automated. Let’s make a directive to automate what we can (Notice I’m using coffeescript, js is also provided in the github project). bscField can accept a few attributes and uses transclude to allow customization of input itself. It’s a great strategy for including css framework gunk too. Check out the field.html partial. We can use it like this. Notice I am still repeating myself a good bit. Consider it a work in progress. The input itself actually can’t be done in the partial and still work with ng-forms. Details here. Notice we are really just tying a model to our scope so we can access our options (rest options method) and the poll itself. We’re also adding a save function to the scope that we can have trigger on blur. ngRoute is being used to determine the id of the poll we are on. It’s probably best to just play with the github project and ask any questions you have in comments. Or perhaps tell me why I’m insane for doing things this way. DRF will return a 400 (BAD REQUEST) when you attempt to save something invalid. Best of all it returns a reason why! Our directive can show this (and other states) to the user. I already linked your post on stackoverflow under my question about posibility of scafolding forms in JS frameworks using Django REST Framework OPTIONS.